Over the past few weeks, the U.S. newspaper industry has entered a new period of decline. The parent of the papers in Philadelphia declared bankruptcy, as did the Journal Register chain. The Rocky Mountain News closed, and the Seattle Post-Intelligencer, owned by Hearst, will almost certainly close or only publish online. 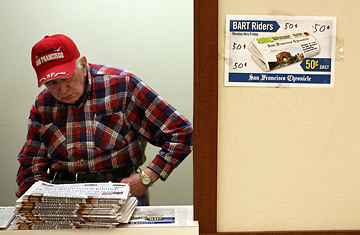 Hearst has said it will also close the San Francisco Chronicle if it cannot make massive cuts. The most recent rumor is that the company will lay off half the editorial staff. Still, that action may not be enough to make the property profitable. 2. The Minneapolis Star Tribune has filed for Chapter 11. The paper may not make money this year, even without the costs of debt coverage. The company said it made $26 million last year, about half of what it made in 2007. The odds are that the Star Tribune will lose money this year if its ad revenue drops another 20%. There is no point for creditors to keep the paper open if it cannot generate cash. It could become an all-digital property, as supporting a daily circulation of more than 300,000 is too much of a burden. It could survive if its rival, the St. Paul Pioneer Press, folds. A grim race. 3. The Miami Herald, which has a daily circulation of about 220,000. It is owned by McClatchy, a publicly traded company that could be the next chain to file for Chapter 11. The Herald has been on the market since December, but no serious bidders have emerged. Newspaper advertising has been especially hard-hit in Florida because of the tremendous loss in real estate advertising. The online version of the paper is already well read in the Miami area, Latin America and the Caribbean. The Herald has strong competition north of it, in Fort Lauderdale. There is a very small chance it could merge with the South Florida Sun-Sentinel, but it is more likely that the Herald will go online-only with two editions, one for English-language readers and one for Spanish. 4. The Detroit News is one of two daily papers in the big U.S. city badly hit by the economic downturn. It is unlikely that it can merge with the larger Detroit Free Press, which is owned by Gannett. It is hard to see what would be in it for Gannett. And with the fortunes of Detroit getting worse each day, cutting back the number of days the paper is delivered would not save enough money to keep the paper open. 5. The Boston Globe is, based on several accounts, losing $1 million a week. One investment bank recently said the paper is worth only $20 million. The paper is the flagship of what the Globe's parent, the New York Times, calls the New England Media Group. The Times has substantial financial problems of its own. Last year, ad revenue for the New England properties was down 18%. That is likely to continue or get worse this year. Supporting larger losses at the Globe will become nearly impossible. Boston.com, the online site that includes the digital aspects of the Globe, will probably be all that remains of the operation.